Traditional floor screed typically includes a mixture of sand and cement, mixed at a ratio that is between 3 to 5 parts sand and 1 part of cement. 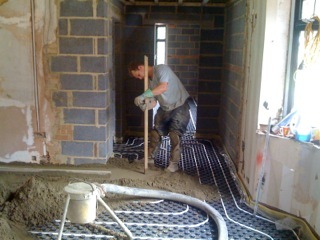 With traditional screed, Polypropylene Fibres (PPF) is the most commonly used reinforcement product. The drying time for traditional screeds varies based on the mixture used, current weather conditions and the depth. This type of screed is typically applied using a straight-edge plastic or wooden float and is finished with a power float or trowel. Fast drying screeds are perfect for projects that need to be completed quickly. These types of screeds are suitable for under floor heating and for many other types of systems as well. Fast drying and rapid dry screeds can be used in both large and small areas that require fast drying times. They are installed using a fast drying pump, which decreases the drying time, making the surface ready for the next stage of the project faster. 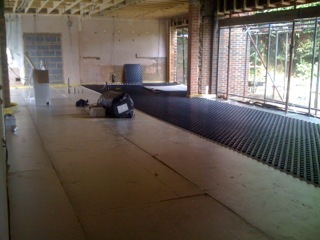 Floating screeds work well for both domestic and commercial uses. Typical domestic applications include chipboard or plywood, while commercial installations should include 25mm thick dry flooring elements. Floating screeds are made from Polystyrene panels that are pre-routed in different patterns and are laminated with strong foil. The foil reduces drying time by diffusing the heat uniformly across the surface, making floating screeds a good option for those who don't have a lot of time to waste. Bonded latex screeds are used for resin flooring. Resin flooring systems are long lasting and are highly resistant to chemicals. They are well-suited in areas that require a seamless, joint free finish. These types of flooring systems are also appropriate in areas that must be kept clean. Dairies, abattoirs, food processing plans, storage plants and other general heavy duty plants are the types of environments that are suitable for bonded latex screeds. 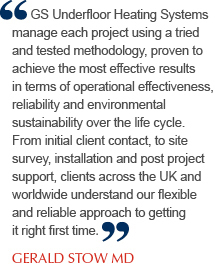 Utilizing screed reinforcement is recommended for screed constructions. There are several options available that consist of fibres or metal mesh. 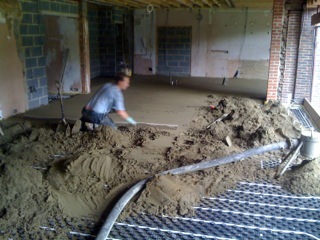 The purpose of screed reinforcement is to restrain the drying stress that the cement in a screed system generates. When screed is drying, its natural inclination is to curl and crack, causing shrinkage. Reinforcement is designed so that if there is a crack during the drying process, it will hit the mesh or fibres and deflect the stress. This greatly reduces the chance of damage occurring as a result of the crack. 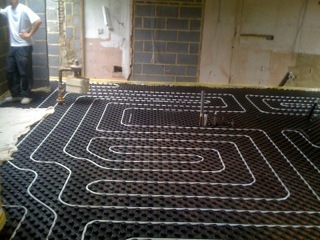 Underfloor heating heats from floor to ceiling using a radiant system. These types of systems reduce the amount of wasted heat and provide optimum comfort in each room. The goal of a floor heating design is to create a uniform temperature throughout a structure in order to ensure comfort throughout the building. The heating source for these types of systems is typically gas, oil, solid fuel or electric-resistance hot-water condensing boilers. Screeds that are designed specifically for under floor heating systems must be used in these types of constructions. Liquid Screed is a blend of binder and selected aggregates mixed with clean potable water to produce a flowing pumpable screed. The Liquid Screed is designed to provide a smooth level surface in both commercial and domestic buildings prior to the application of floor finishes and is particularly suitable to application as a floating screed and for use with underfloor heating systems.